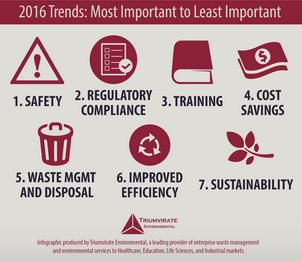 Most environmental, health and safety professionals feel their department is understaffed and say it won’t be growing in 2016, according to Triumvirate Environmental’s first annual State of EH&S report. 二、More than 72 percent of EHS professionals feel their department is currently understaffed and 79 percent of EHS departments won’t be growing in 2016. Of all industries, educational institutions had the highest percentage of respondents who felt their EHS department was understaffed at 82 percent. 3.Regulatory Updates Are A Focus. Regulatory compliance was a close second to safety for most industries when asked about trends and challenges (aside from life sciences that put sustainability in the second spot). The majority of respondents cited constantly changing regulations and increasing fines as the reason. 4.Sustainability Isn't Quite There Yet. Sustainability ranked least important out of seven possible initiatives for 2016 (including safety, regulatory compliance, training, waste management and disposal, cost savings and plan improvement). Warren Sukernek, director of marketing at Triumvirate Environmental, says the report shows a lack of staffing and resources limit EHS professionals ability to implement sustainability programs that can improve operational efficiency. “If organizations were allocating more funding, I think we’d see a greater focus on sustainability and using technology to streamline existing processes,” he says. Sasha Laferte, Triumvirate’s research lead for the report, says the findings should be a “call to action” because it shows stagnant budgets are preventing EHS employees from focusing on new initiatives that will advance sustainability, innovation and growth. NEXT REVOLUTION OF ESH MANAGEMENT!